Maybe Capcom should try their hand at a traditional side-scrolling Mega Man game. If they are going to iterate upon a franchise, at least let it be one of the ones that the fans would die for. 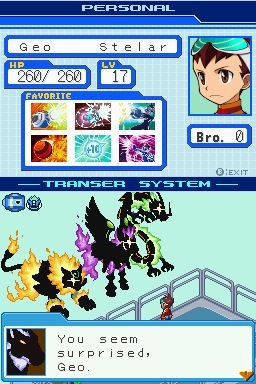 Instead, they chose to release another Mega Man RPG, this time around called Mega Man Star Force. Bad choice, guys. RPGs are great -- or not, as is the case with this game -- because of their stories. This game's story, filled with cliches like a long lost father, never grabs the player and draws them in. I never once felt a connection to my character, or cared about the upgrades or items they had. Instead, the plot of this game was ultimately forgettable, encouraging me to just hold B to make it scroll fast, so that it would end. We could take the time to tell you all about the plot right now, but see, the thing is, we're already forgotten ourselves. I hear that happens with traumatic memories. The graphics of the game are ok, but, with the exception of the battles, don't stand out as anything special. When you are just running around the map, the game's graphics are GBA quality. The battle screens do a nice job of utilizing shade-cell graphics, but even they are ultimately overshadowed by the boring backgrounds and fighting board. The graphics made the whole title feel like it lacked polish. The biggest redeeming factor of the game is the battle system. Though the game does unfortunately have random battles -- which happen far too often -- the battles themselves can be fairly intricate. Players select the cards they want to use, and play from a virtual list, utilizing cards for special attacks, and shooting with their gun while they wait for the timer that goes between bouts of special moves. Because the battles are reliant on timers for weapons, both the player and the enemies can move around in real time. This adds to the strategy, as both players and NPCs dance around the board, shooting and dodging. The battles will be fun for a while, until you see through the gimmick and they just feel so repetitive that you get mad when they occur. Battles started to become tedious, with the ones that lasted over twenty seconds seeming like an eternity. The variations in enemies, and more importantly tactics, are so few that the battles feel stale. Unfortunately, there were no friends available for us to trade cards with, or form brother-bands (the game's equivalent of a friend's list) with. So, no, we didn't get to try out the game's online functionality, but overall we'd say that this is a good thing, since it also means that none of the people we consider close enough to call friends have been allowed to purchase the title. The online functionality serves to make it easy for people to trade cards with one another, but that functionality also presents quite the conundrum: do you really want to damage your friendship and make that person go out and buy this game just so you can trade cards? Playing through the title, I almost forgot that it actually was a DS game. The DS functionality, save for its use in the menus, is so spread out and forced that it will literally (ok, perhaps not literally) shake your head when you see it. From tapping the screen on spots that appear, to dragging missiles around, the stylus controlled minigames are unsurprisingly boring and unoriginal. It would have been better to not have touch-based minigames at all instead of forcing the crappy games into the title. The battles are stale, the storyline is boring, and the graphics are fairly weak; what more does I have to say to make you avoid this title? The only ones who are going to enjoy this game are the people that purchased the previous Mega Man RPG games, and even then there is a strong chance that the repetition in this game might make them smash out the nearest window to them as they realize they've been duped by Capcom. Again, if you're going to make un-original iterations of a Mega Man game, at least make them the side-scrolling action games of ol'. What's Not: The combat gets boring...much like everything else.